Behind many ten minute successes lie hours of preparation. According to my dentist during a little buffing after a $200 smear of white Bondo. Lately, at the secretive Luthier Laboratories, pushing boundaries past conventional instrument repair, we’ve found those preparation-to-execution numbers to be a bit skewed. In this case, hours and hours were spent converting this “Sold For Parts” French violin into a viable instrument. As we near the final cavelletti, hands and clamps in piaffe and pirouette, this early 19th century Mirecourt nears a milestone. Sound post and tone tap, the first in 120+ years we surmise (the repairs of 1886 were never completed). At every step, to poke, prod, shave, raise, lower, scrape, and in general convince the parts to obey, our Lie-Nielsen ⅜” chisel is there to assist. An extension of my fingers but with enhanced fingernails. A2 Tool Steel, hardened to Rockwell 60-62, cryogenically treated and double tempered. Our mortised end block holds us up no longer. After this Mirecourt skipped the entire last century, we’ll soon be having a conversation. Talk about dropping out! Welcome back! This entry was posted in Craftsman / Artist, Music and tagged lie-nielsen, Mirecourt violin, mortised violin end block. Waiting for the “right job” to come up was taking forever. I’d been wanting this compact manganese bronze hand plane upon first sight online, and began rationalizing the purchase as a ‘deserved’ luxury item after handling one at a Lie-Lielsen Hand Tool Event® a year ago. Opportunity came in the form of a mid-19th century French-made Sébastien Kloz violin. She wanted a little nip and tuck fitting back into her old clothes. With chisel and file, it could have been done. But for precision, and in a far more civilized manner, she wants the Lie-Nielsen Violin Maker’s Plane. Perfect results, as anticipated! Depth of cut adjustment was exact and did not ‘creep’ after tightening. You spend more for quality, but you get more satisfaction. Long after the price tag is forgotten. At about the same time, a Depression-era Antonio Stradivari copy – probably a copy, but one never knows – came knocking for a bit of fingerboard thinning. The Stanley Handyman again, at 9-1/4″, or the Lie-Nielsen 101, at 3-7/16″? 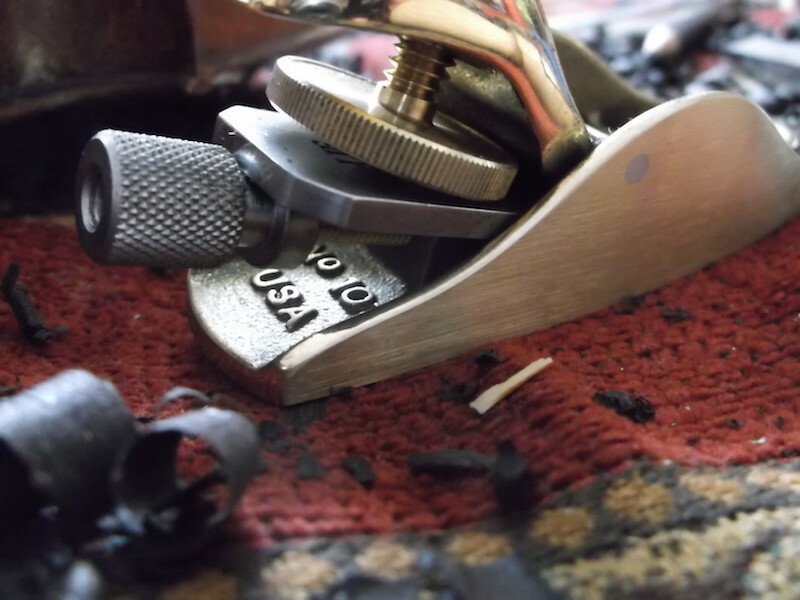 The USA-made vintage Stanley performs admirably but is a bit top-heavy and too big. 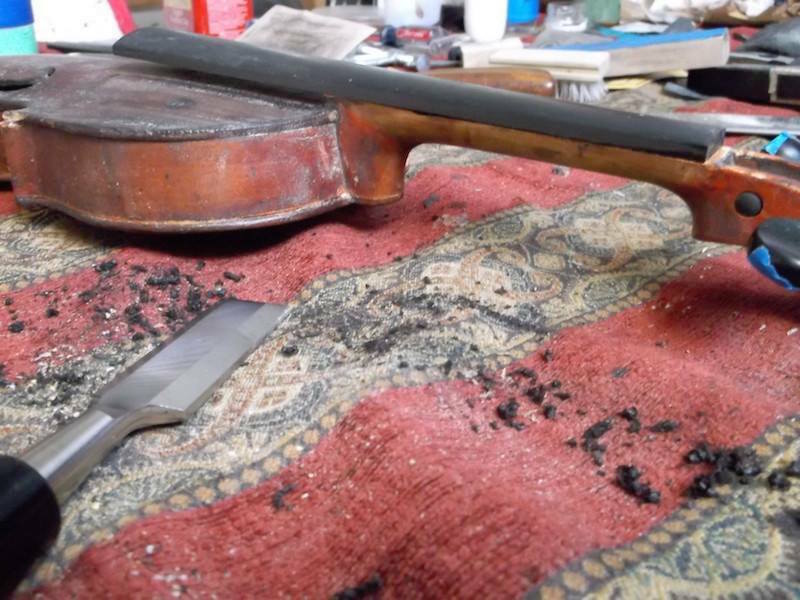 The Lie-Nielsen 101 finished the job with perfect control, but is a bit too small for shaping a 4/4 violin ebony fingerboard. Maybe a Goldilocks Plane exists, juuuuust right. The Lie-Nielsen 102? Where the Lie-Nielsen came through with presidential prowess? Cutting a tiny bevel along the edges of the fingerboard. I forgot to put them in when the nut and strings were off, but the 101 is perfectly suited for close, delicate work. Since the nut was already glued, a gentle swipe with my Lie-Nielsen scraper seamlessly finished up the last bit of bevel. 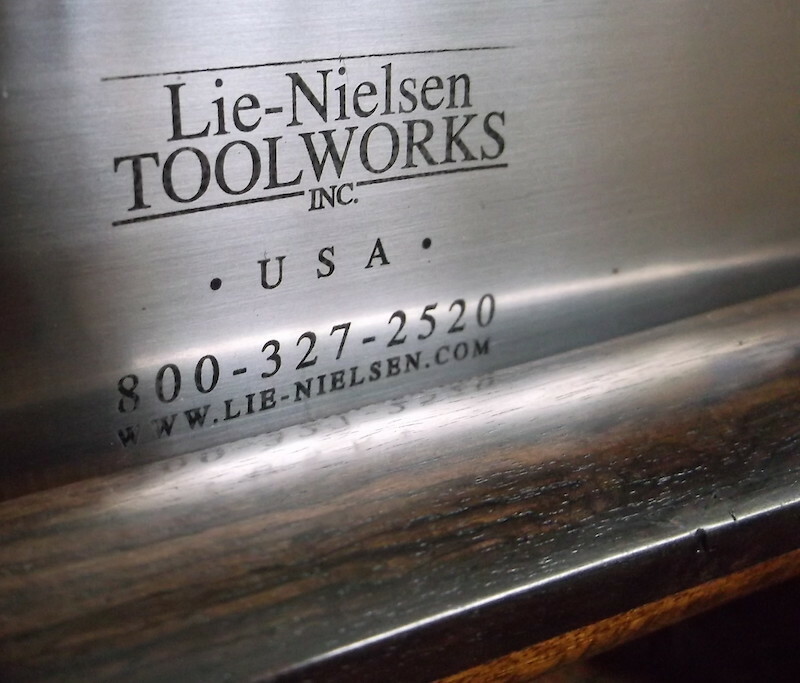 This entry was posted in Craftsman / Artist and tagged lie-nielsen, Sébastien Kloz, violin maker's plane. More information please. From cross country, a clear polite request. Her gentle Oklahoma accent could not mask underlying confusion. Even Aunt Flo knew I was using my chisel the wrong way. Time to change the conversation! 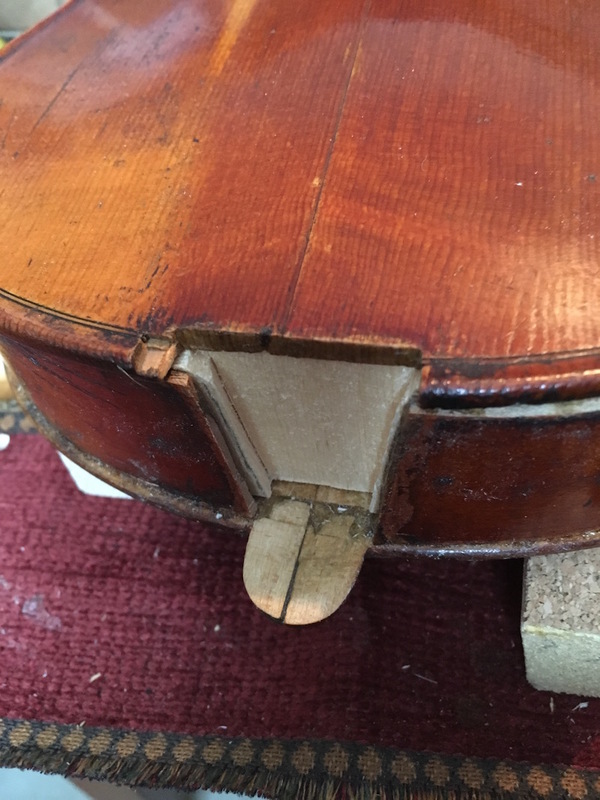 For several years violins have been coming across the table. In common with many? A misfitted fingerboard. Askew, misshapen, wrongly sized, they were permitted a challenged existence because I lacked tools and knowledge. One day I scraped away a blemish upon the ebony and discovered . . .
Ebony shaves nicely. It scrapes even better. With some lost cause violins on hand, I experimented with the sharpest edge I had, the side of my freshly honed Buck Bros. chisel. After a month of chisel abuse, the tool-sharpening guy was incredulous, cursing in his native manner. I knew it was bad from his furrowed brow, disrespect for his sharpened edges. Enough of my luthiery antics! Doing the unthinkable, I consult an expert. And found the right scraping tool was only a few dollars away. Lie-Nielsen Hand Tool Event folks were in town, had the scrapers, allowed me hands-on examination, and provided sacrificial hardwoods – which I reduced to scrapings. They demonstrated sharpening and honing. 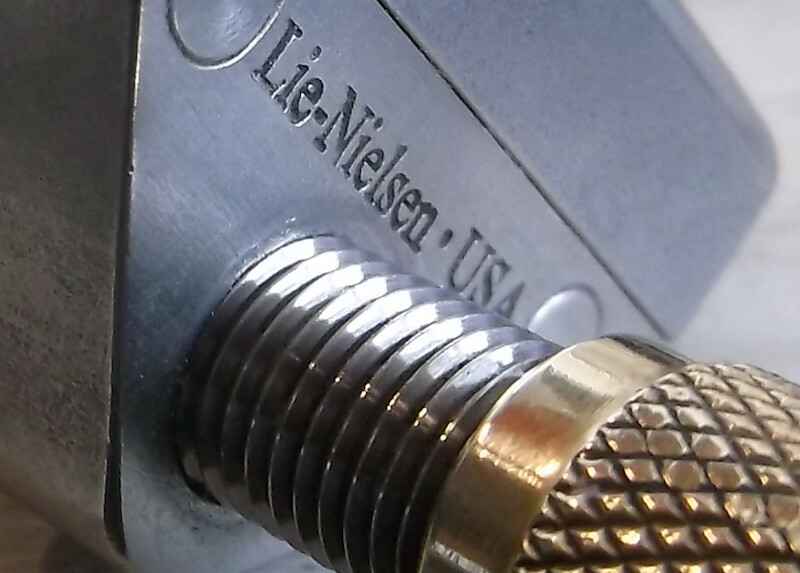 For less than a Jackson, a pair of Lie-Nielsen scrapers in two gauges, delivered to my door. We now achieve Top Hat performances, thinning new fingerboards by plane and scraping a smooth correct radius. The fun part? A final scraping of the neck / fingerboard seam. Two woods meeting so closely together, they feel like one. After a bit of love and caressing. From Lie-Nielsen. 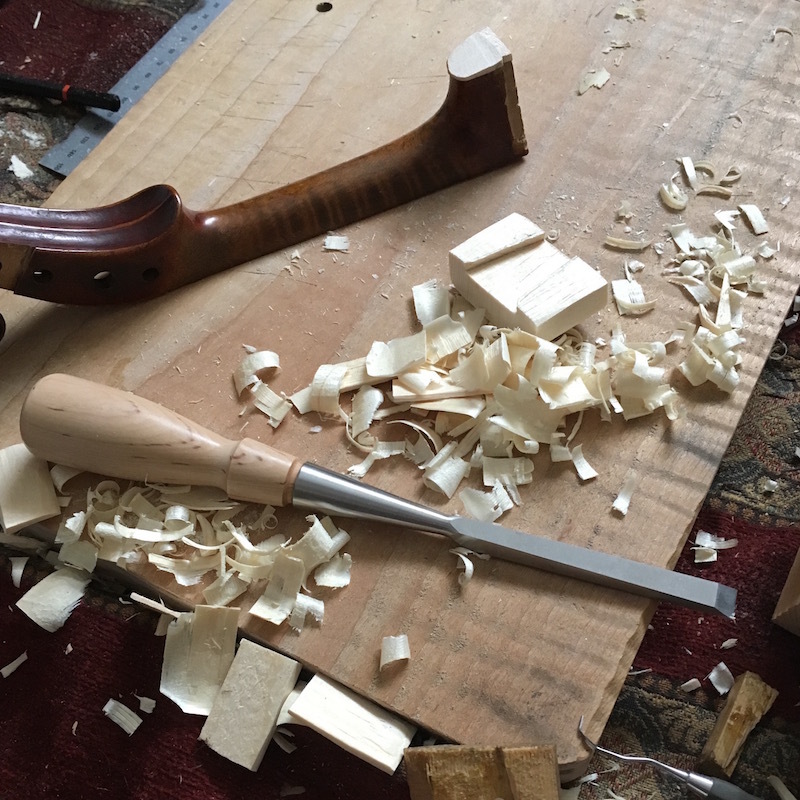 This entry was posted in Craftsman / Artist and tagged lie-nielsen, violin fingerboard scoop, wood scraper.